The RumbaTM Rectangular Nesting Table provides an efficient, space-saving and reconfigurable table option for open office spaces, meeting or training rooms, and other work areas. The tabletop is made of a 1in. high-pressure laminate with 3mm vinyl t-molded edging for long-lasting durability. The top has a black mesh modesty panel and folds down for nesting and simple storage. 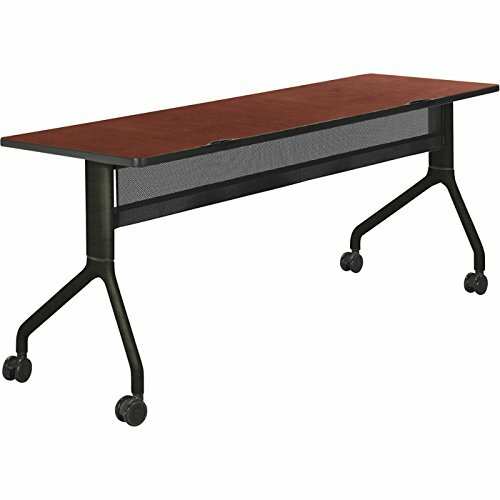 This Rumba table features integrated cable management and rolls easily on 4 dual-wheel, non-marring casters (2 locking) for simple rearranging. Secure nesting tables together with optional Rumba Ganging Device, Model# 2060BL (Item#62201, sold separately). An optional Clamp-On Power Module, Model# 2059BL (Item# 62200, sold separately) provides 3 grounded outlets and 2 Ethernet data connections.